Comedy-musical adapted from the original idea by John Sullivan. Music by the late Chas Hodges (Chas & Dave), co-written by and starring Paul Whitehouse with Jim Sullivan. "Mais ouis, mais ouis, the world may have changed a lot since we first bid a jovial 'au revoir' to the Trotters of Peckham, but good 'ol Del Boy, Rodney and the rest of the gang haven't changed a bit... well, apart from the odd spontaneous bursting into song here, and the occasional dancing across the market, there. 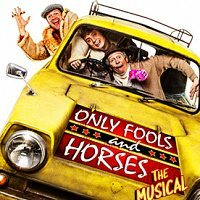 The landmark, record-breaking and top-rated television series Only Fools and Horses, written by the late, great John Sullivan, undoubtedly holds a special place in the hearts of the British public. Now John's son Jim Sullivan has teamed up with comedy giant Paul Whitehouse to write and produce a script and score to honour his father's legacy; recreating the iconic series into a brand-new, home-grown British Musical spectacular. Lovely Jubbly!"